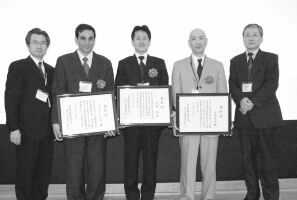 At the 100th Annual Meeting of the Japanese Society of Animal Reproduction, held in Tokyo, Japan in October, the 2007 JSAR awards were presented to each winner. 2007 JSAR Award Winners. From left, Kunio Shiota (President of Organizing Committee for 100th Annual Meeting of JSAR), Mohamed Sabry Medan, Satoshi Ohkura, Masumi Hirabayashi and Masugi Nishihara (JSAR Chief Director). Laboratory of Animal Production Science, Graduate School of Bioagricultural Sciences, Nagoya University, accepts the 2007 JSAR Outstanding Research Award. Satoshi Ohkura (Laboratory of Animal Production Science, Graduate School of Bioagricultural Sciences, Nagoya University) for "Studies on the Central Mechanisms Regulating Reproductive Physiology and Behavior in Ruminants". Section of Mammalian Transgenesis, Center for Genetic Analysis of Behavior, National Institute for Physiological Sciences, accepts the 2007 JSAR Innovative Technology Award. Masumi Hirabayashi (Section of Mammalian Transgenesis, Center for Genetic Analysis of Behavior, National Institute for Physiological Sciences) for "Technical Development for Producing Gene-Modified Rats". Department of Theriogenology, Suez Canal University, Egypt, accepts the 2007 JSAR Young Investigator Award. Mohamed Sabry Medan (Department of Theriogenology, Faculty of Veterinary Medicine, Suez Canal University, Egypt, "Studies on Mechanism Responsible for Regulation of Follicle- Stimulating Hormone in the Goat". Tomohiro Yonezawa (Kitasato University) for "Metastin May Induce Apoptosis of Luteal Cells via Gonadotropin Releasing Hormone in the Corpus Luteum of Rats"
Sugako Ogushi (RIKEN Kobe Institute) for "A Unique Role of Maternal Nucleolus in Early Mammalian Development"
Satoshi Tsukamoto (Tokyo Medical and Dental University) for "Regulation of Autophagy in Embryogenesis in Mice"
Yoko Inamoto (Nagoya University) for "The Role of Arcuate Metastin Neurons in Regulation of Pulsatile GnRH/LH Secretion in the Female Rat"
Azusa Inoue (University of Tokyo) for "Analysis of the Determinants of Meiotic and Developmental Competence in Mouse Oocytes"
Seungwook Shin (Kinki University) "A Novel Gonad-specific Gene DD2-2 Involved in Early Zygotic Gene Activation (ZGA) in Mouse Pre-implantation Embryos"
Kazuyoshi Kise (Tokyo University of Marine Science and Technology) for "Purification of Fish Spermatogonia Using Flow Cytometer"
Yuko Hirosawa (Iwate University) for "ISG-15 Gene Expression Patterns Derived from Peripheral Blood Leukocytes During the Pre- and Post-breeding Period in Dairy Cattle"